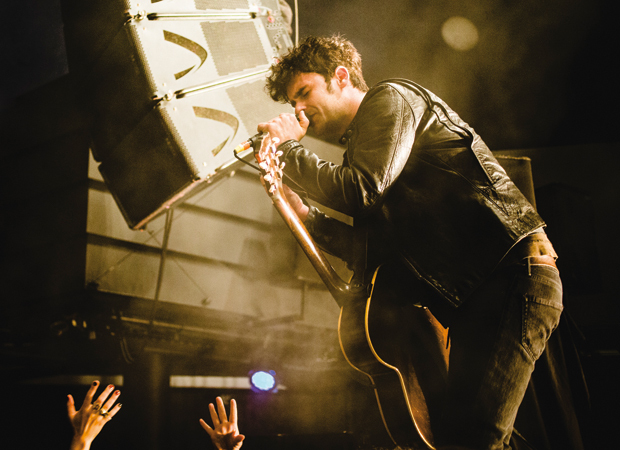 Perth’s lovers of alternative rock ‘n’ roll were served up an immaculate evening of music courtesy of legendary San Francisco outfit Black Rebel Motorcycle Club. Opening the gig in true style off the back of a fantastic performance at the WAM Saturday Spectacular were Perth’s own Sugar Army. Sugar Army are akin to a coiled snake; their potential energy and control are almost palpable. The drummer alone was a microcosm of this aesthetic as he kept a steady, thumping rhythm which was only broken by explosions of perfect high tempo rolls. The wave-like modulated white noise and pads from the keyboardist served to further accentuate the parabolic nature of the bands set as they pushed and pulled the crowd through their journey. It was time for the main act and Black Rebel Motorcycle Club are something else entirely. While staying true to classic rock ‘n’ roll sensibilities, they possess a flair for progression that could honestly induce a transcendental state. Entrancing and meditative are not words you often see next to stunningly heavy, but lying just underneath the head-banging riffs and slamming percussion produced by this ineffably cool trio was something immeasurably deep. Washings of reverb, delay and pulsating distortion wrapped around the music, giving the impression of a majestic writhing organism. The blushed faces of the crowd were a sight to behold as eyes widened and mouths split into grins of pure pleasure, gradually gaining in vividness as BRMC pumped their fire into the venue. When we all thought it was said and done, the group returned to the stage, acoustics guitars and harmonicas on hand to give the crowd another chance to become a part of their sonic world. Before loving and leaving us, lead guitarist Robert Levon Been humbly thanked us for being there, exclaiming that we were all beautiful, which was perhaps an enlightened example of seeing yourself in others. When musicians and personalities like this come together, the experience becomes more of a conversation with the audience than just a performance. The lack of ego, coupled with a real love for the music they make, manifested the highest purpose of a live performance; giving people the opportunity to touch and interact with moments of crystallised creative energy, brought to life by deft hands and narrated by thoughtful and melodic story telling. It’s this sort of honest and honourable commitment to the purest calling of rock ‘n’ roll that makes a gig memorable. Until our next dose of realness, we’ll be floating in the wake of this high definition experience.